For a period of time, Mauch Chunk in Carbon County was, in the words of historians Donald Miller and Richard Sharpless, "Pennsylvania's most famous boom town." The main reason for this particular boom was the decision by Lehigh Coal and Navigation Company, the nation's first anthracite coal operator, to keep its headquarters in the town. 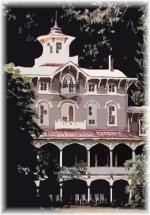 Asa Packer Mansion, Jim Thorpe, PA, circa 2000. Soon aspiring young men such as Asa Packer, founder of Lehigh University, arrived to make their fortunes, building "Millionaires Row" in the process. The Lehigh Canal and later, the Lehigh Valley Railroad, built by Asa Packer, helped coal dominate the local economy. Leap-the-Dips, Altoona, PA, circa 2006. Nineteenth-century magazines offered travel reportage about Mauch Chunk, encouraging visits to "America's Switzerland," recounting rides on the famous "gravity" railroad, and describing sights of the bustling coal mines and collieries. The black "stones" that Philip Ginter discovered had indeed become diamonds. Less auspicious but certainly notorious was the scene in Mauch Chunk on "Black Thursday" in 1877, when the first of Pennsylvania's two mass executions took place. Molly Maguires had been active in the southern coal fields, in Carbon and Schuylkill counties. Four people accused of being Molly Maguires and of killing local mine officials were hung in Carbon County's first execution. It had been scheduled to take place before the mass hangings in Pottsville of six purported Mollys on the same day. More executions were to follow.